my new line of cedar chests.all solid wood througout .Completely cedar lined inside.Solid wood top with mitered front and sliding dovetail bread board ends.Built to last! Wonderful project! Complicated panels and rails and stiles, impressive work. Thank you for sharing. Very rich looking design, the panels really set it off. Great finish too. Solid looking build. 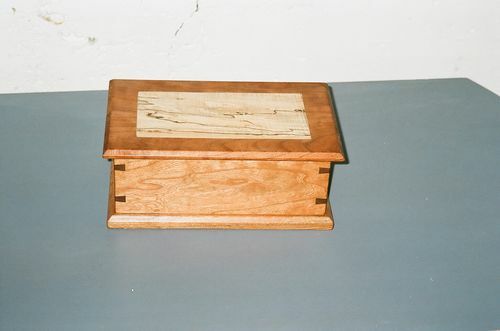 cherry jewelry box with flush spalted maple inlay panel and walnut dove tail blocks.It was sanded mirror smooth and 7 layer of special finish sanded between layers,Final finish sanded with 2000 grit wet dry.